Although many of us believe that students who do not get seats in regular college take correspondence course or opt for university distance education. This may be one of the reasons, but not the only reason. University distance education offers many benefits like You can get education of your choice, It saves travelling time to class and the expense of paying for travel, food or buying new clothes to wear to a traditional classroom. Most of the university distance education options offer a great deal of flexibility. The students are able to study at their own pace, going as slow or fast as they are able. Person with either a full- or part-time job can take a correspondence course with less interference from work hours and University distance education also facilitates a person to spend more time with family, on hobbies, and on other priorities. Just consider the main objective of the Indira Gandhi National Open University (IGNOU), the largest university in the world which offers distance education to 4,000,000 students, which was founded to provide higher education opportunities particularly to the disadvantaged segments of society, you can find many other benefits. Besides imparting quality and variety in education, this education system has strengthened the human resource of India. IGNOU offers 175 academic programs comprising 1100 courses at certificate, diploma and degree levels. It also offers a number of non-accredited extension and skill-oriented programs. This offering enables one to choose the course to maximize his/her benefits. Annamalai University, Osmania University, Sikkim Manipal University, Symbiosis Center for Distance Learning, University of Madras, Mahatma Gandhi University, Karnataka State Open University, ICFAI University etc. Besides these many universities both central and state, do have their distance education department offering different course through correspondence. Most of these distance education universities in India select candidates via online tests whereas some provide admissions simply on the basis of the student’s merit. Besides young college students, University distance education courses focus on full-time employees, military personnel, and other non-traditional students unable to attend in-person classroom lectures because of their economic status or location disadvantage. Often, students may need a particular course for their educational attainment or technical education or enhancement of skill but don't live where it is offered; for them the distance education becomes the best option. When signing up for a correspondence course, be cautious of claims that may not be legitimate. All distance learning degrees should be awarded with recognition from Distance Education Council (DEC)/UGC/ AICTE. A common misconception is that correspondence learning always saves money and guarantee employment. This is not always the case, check before taking final decision. While choosing the course the first step is to narrow down what you want to study. Figure out what you are interested in studying. You may want to take courses to advance your career or change your career. Alternatively, there may be courses you wish to complete the degree that you started and never finished. Then again, you may just want to study the things that you enjoy most. Choose the course and check where it is offered and match it with your needs and aptitudes. You need to choose amongst the programs also (post graduation/degree/diploma/certificate/skill program etc. ), select the one that benefits you most. It is not also a good idea to go for computer science in an institution famous for management. Likewise, it is not good to take fine art correspondence courses in universities that are known for social sciences. Select carefully and cautiously. 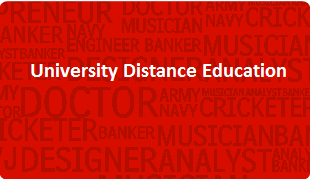 Besides India, University distance education is also available across the globe. It may be beneficial to choose the program offered by foreign University in collaboration with a known Indian University. Know the right course for you!